Nineteen-term U.S. Rep. John Murtha of Pennsylvania died Monday, according to a statement from his office. Murtha had been in intensive care in a Washington-area hospital after suffering from an infection following gallbladder surgery. He was 77. The Democratic congressman, first elected to the House in 1974, wielded wide influence as chairman of the defense appropriations subcommittee, the man responsible for dolling out funds to the Pentagon. He also mentored younger lawmakers on the ins and outs of Washington’s power circles. He represented Pennsylvania’s 12th district, which has struggled amid the economic downturn. According to the New York Times, Murtha became Pennsylvania’s longest-serving congressman just this past Saturday. “A right-hand man of House Speaker Nancy Pelosi, he was considered one of the most influential lawmakers on Capitol Hill and credited with her ascension,” the Washington Post wrote of Murtha on Monday. Murtha leaves a reputation as an outspoken lawmaker not afraid to earmark money for his district. His entry in the 2010 Almanac of American Politics calls him an “energetic earmarker.” Facilities, including a highway, airport and health center, bear his name in Johnstown, Pa., the main city in his district. His death leaves an open spot in a competitive House district, according to NewsHour friend Chris Cillizza from the Washington Post. Cillizza writes that a special election for the seat will likely be held May 18. A former Marine and Vietnam war veteran, Murtha was also a strong voice for U.S. withdrawl from the Iraq war in 2005, despite voting to authorize the initial use of military force. Murtha began his political career in 1969, serving in the Pennsylvania House in Harrisburg until he was elected to Congress in a special election in 1974. In 1990, he retired from the Marine Reserves as a colonel, according to an Associated Press account of his life. 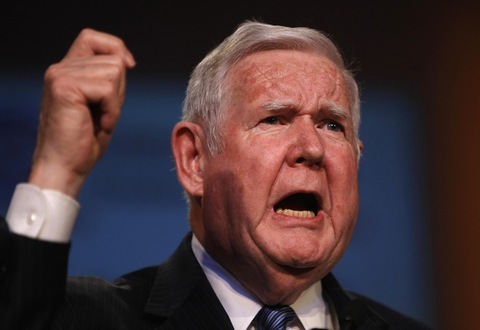 Among the lower points in his career, Murtha was linked to the Abscam scandal of 1980. He was caught on tape discussing bribes with an undercover FBI agent, but did not take money. Murtha was never charged. You can see one of Murtha’s last interviews, with his hometown newspaper, here.